Old Rishworthians lost 33-24 at home to Novocastrians in a National Intermediate Cup pool game yesterday with the outcome hinging on a controversial red card after 30 minutes. It spoiled what was otherwise a competitive game between two equally-matched sides. The marching orders were handed to Rishworthians centre Jack Fairbank after the referee judged a high tackle worthy of a dismissal. It came with Rishworthians leading 14-12 and after skipper Fraser Swarbrooke was just returning from a yellow card for a tackle which the referee also judged high, although other apparent high tackles in the game went unpunished. While Swarbrooke was off the visitors went over for a pushover and gained a penalty try. Up to the red card it was end to end with Rishworthians opening well and wing Doug Heseltine intercepting and racing for the line, only to be called back for an earlier infringement. The Copley men had to defend well before breaking upfield. From a scrum just inside the Novos half, No 8 Gerard Rollings picked up and set off for the line. 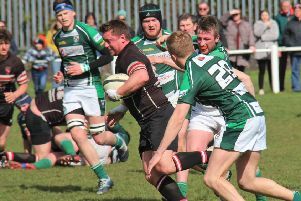 As the cover came in he passed to scrum half Chris Cullimore, who cruised over. Fullback Sam Bake converted. The visitors hit almost straight back and a speculative kick to the corner was gathered for an unconverted try. Back came Rishworthians and stand-off Luke Flanagan was involved several times before prop Phil Kershaw finally crashed over. Bake converted. Then came the penalty try, but the home men still looked strong until they were stunned by the red card and almost immediately conceded a converted try as Novos forced their way over. They too than received a yellow card and Rishworthians regrouped and came back strongly to finish the half with a 17-19 scoreline thanks to a Bake penalty. The visitors scored early in the second half with a converted try after the right wing found himself with oceans of space. Restored to a full complement, they continued to press until the extra man finally told with a converted try from a catch and drive. Despite being one man down Rishworthians fought right to the end and got some reward with a brilliant try. Lock Callum Heseltine set it up with a strong run before the ball came back to replacement Josh Kelly. He put in the perfect kick for Bake to gather on the run and feed Doug Heseltine for the try. Kelly converted. Rishworthians continued to press but could not add to their score.